Martino Finotto, who has died at the age of 80 after a long battle with cancer, made his mark in our sport as a driver, a team owner and engine constructor. 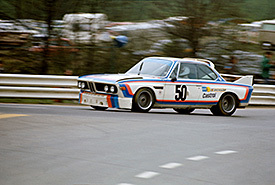 The high point of the wealthy Italian's 20-year racing career came with victory in the 1979 European Touring Car Championship aboard a self-run BMW 3.0CSL entered under the Jolly Club banner. He claimed the title with long-time co-driver and business partner Carlo Facetti after winning five of the final six rounds. Finotto, who won a total of 12 ETC races in 1977-79, had already contested the blue-riband 24-hour enduros at Le Mans and Daytona and turned his attention to sportscar racing after winning the touring car crown. He raced a privateer Group 5 Lancia Beta Montecarlo in the 1980 World Championship for Makes and ran a Ferrari 308 GTB turbo, which was reputed to have 1000bhp in qualifying trim, alongside the Lancia the following season. The Ferrari was developed by Finotto and Facetti's CARMA operation - the name of which was derived from the opening letters of their christian names - and this tiny organisation subsequently built a bespoke four-cylinder turbocharged engine for the new Group C Junior category for 1983. Badged a Giannini after the Fiat special tuner because CARMA needed a manufacturer for homologation purposes, this engine claimed back-to-back World Endurance Championship titles in the secondary Group C category in 1983-84 together with Italian racing car constructor Alba. Finotto took a total of four class victories in the first season sharing with Facetti. Almo Coppelli, who drove for the CARMA Alba set-up in the second of those seasons and subsequently raced with Finotto in the US IMSA series, remembers a man who was at once passionate for motorsport and a hard taskmaster. "Martino was driven by his passion, but he always gave me a hard time," says Coppelli. "He and Facetti were old-school guys and really tough with me, but I learnt a lot - racing with them was part of my schooling. "Facetti did everything in the team: he was the driver, the manager and the engineer. Finotto paid the bills, but we was a decent driver who was never far off the pace." 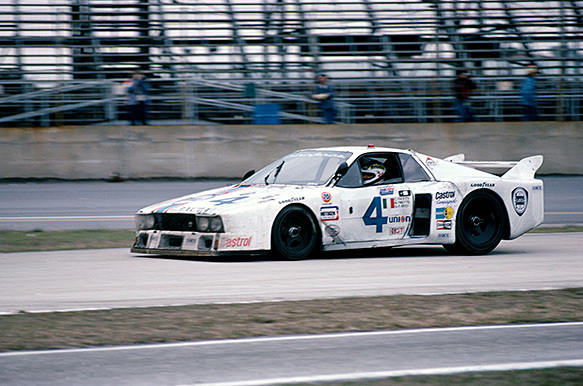 Finotto continued racing at the wheel of Albas for much of the 1980s before driving for other marques in the IMSA Camel Lights category through into the early 1990s. He competed at Le Mans on six occasions without breaking into the top 10, but had a best finishes at Daytona of second in 1977 driving a Porsche 935 and a fifth in 1981 at the wheel of his Lancia. Finotto, who made his fortune in the chemical industry, started racing in 1972 and briefly flirted with Formula 1. He bought a pair of Brabham BT42s, but decided against racing them after a solitary test at Monza at the end of 1973. Instead they were fielded by ex-Formula 3 star Jurg Dubler under the Scuderia Finotto banner for a number of drivers through the '74 season, though two-time Le Mans 24 Hours winner Gerard Larrousse's start at the Belgian Grand Prix at Nivelles was the only time the team made it onto the grid. Finotto continued to race into the 1990s, making his last sportscar appearance at the 1995 Sebring 12 Hours.